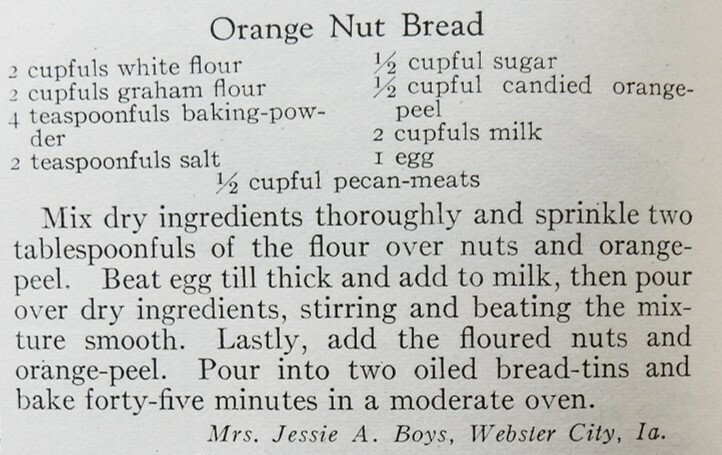 I’m always on the lookout for quick and easy holiday bread recipes, so was thrilled to find a hundred-year-old recipe for Orange Nut Bread. Graham flour, candied orange peel, and pecans give this bread a nutty, yet distinctly sunny, orange flavor. I definitely plan to make this recipe again. It’s tasty, and the candied orange peel makes it just enough different from most nut bread recipes that it is sure to be a hit this holiday season. 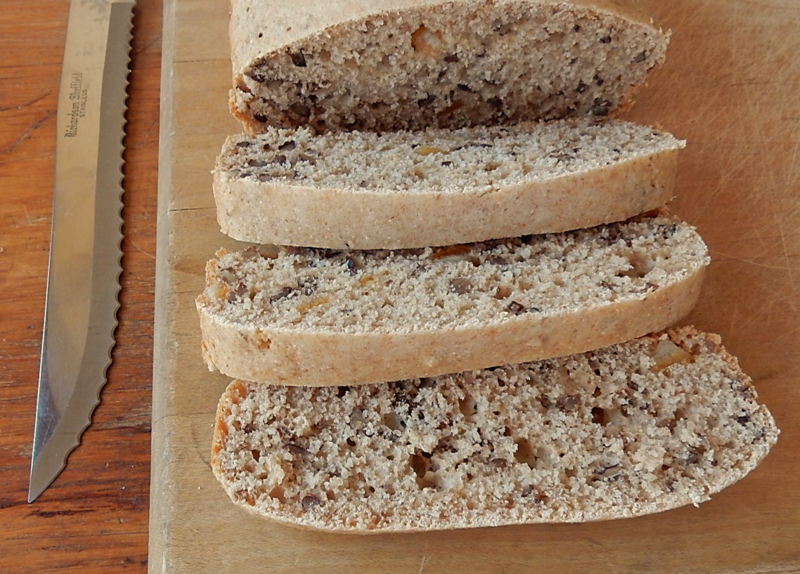 I was surprised that the recipe called for no shortening, and for less sugar than many modern nut bread recipes – but it all worked. This bread has a nice texture; and, while a little drier than some quick breads, is very tasty. When I made this recipe I used less salt than called for in the original recipe. Two teaspoons of salt seemed a tad excessive. In a mixing bowl stir together all-purpose flour, graham flour, sugar, baking powder, and salt. In a separate small bowl, combine the candied orange peel and pecans. Stir in 1 tablespoon of the dry ingredients that had been previously combined to coat the orange peel and pecan pieces. Set aside. Add egg and milk to the dry ingredients in the mixing bowl; beat until mixed. Stir in the orange peel and pecan mixture. Bake 35-45 minutes or until a wooden pick inserted into center comes out clean. Posted on December 3, 2017 December 3, 2017 by SherylPosted in FoodTagged candied orange peel, nut bread, pecans, recipe. How interesting that there is no shortening. I also found it intriguing – but the recipe turned out really well. It is indeed surprising there’s no fat added, but the bread looks so good. Maybe the milk back than had higher fat content? I used 2% milk when I made this recipe, and it worked fine. I think that graham flour may have a higher fat content the the typical flour. That’s an interesting point about the milk. Did you use whole milk? It seems to me that it might work better than the skim I usually have around. Is the orange taste pronounced enough that someone who didn’t know it was orange nut bread could identify it? I’ve never used candied orange peel, and don’t know how strong the flavor is. I used 2% milk. Yes, you definitely notice the flavor of the orange peel, but I liked it. That’s good. I like orange, and was afraid it wouldn’t be strong enough without adding orange zest or something. The flavor is a lot like orange zest – though I think it’s a bit more pronounced since the chunks of peel are larger. The orange peel pieces (as well as the pecans) are large enough that they are noticeable when you bite into the bread. I’ve found a couple of recipes that only use the eggs and milk for fat. They do seem dry. It’s a good excuse to spread butter on them, but I’m wondering how it would be if you did like beer bread recipes and poured butter over the top. Also, have you candied your own orange peel? Butter would be good on this bread – though it’s not needed. I just ate it plain and enjoyed it. I wish that I could say that I made my own candied orange peel, but I didn’t. I just bought some at the supermarket. Sounds good! I might have to try it with just shredded orange peel as I don’t have the candied on hand. I do have plenty of pecans pieces. I liked the pecans in this recipe. Most nut bread recipes that I’ve previously made called for walnuts. That sounds so good! I might have to try it! Looks delicious, I bet your home had a wonderful aroma wafting through it. I love the smell of baking and cooking. I can only imagine how tasty that bread is. Great find! Thanks for sharing. I like anything with orange flavoring added. I can picture people of long ago spreading a pat of butter on each slice before eating. Happy baking, Sheryl! I made this lovely bread a few days ago! Superb in flavour & texture!